Syrian Defector: Assad Will Use Chemical Weapons If He's Desperate : The Two-Way The major general who was head of Syria's chemical weapons division until he defected in July says that if rebels advance on Damascus, President Bashar Assad will deploy his deadly arsenal. 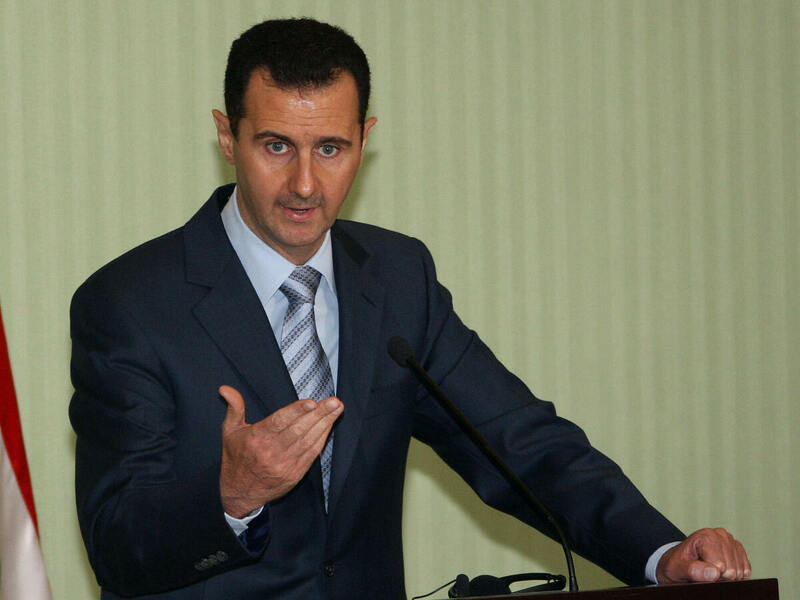 Syrian President Bashar Assad in 2009. If Syrian President Bashar Assad gets desperate enough he will use chemical weapons against his own people, the former chief of staff for that country's chemical weapons tells NPR's Deborah Amos. Maj. Gen. Adnan Sillu, who defected in July and is now in Turkey, is convinced that if rebel forces close in on Damascus, Assad will order the use of mustard gas, sarin or other chemicals in a "last desperate act," Deb reported today on Morning Edition. And as Deb told NPR's Renee Montagne, Syria is thought to have the largest undeclared cache of chemical weapons in the world. If Assad did order their use, though, many analysts say he would be committing "regime suicide" because the U.S. and other nations would take swift and decisive action. "He had been party to top-level talks on the deployment of chemical weapons against rebel fighters and civilians in Syria's second largest city. 'We were in a serious discussion about the use of chemical weapons, including how we would use them and in what areas. We discussed this as a last resort — such as if the regime lost control of an important area such as Aleppo,' Gen.Sillu said in his first interview since his defection. The meeting, held at Syria's chemical weapons center [8 kilometers] south of Damascus, was the 'last straw' for the general, who said he defected because he was convinced the regime would use the weapons against civilians." With opposition fighters making steady progress against Assad's forces, however, the concern about those chemical weapons has only increased since September.
" 'We haven't seen anything new indicating any aggressive steps to move forward in that way,' Panetta told reporters during a flight to Kuwait, adding that U.S. officials 'continue to monitor it very closely and we continue to make clear to them that they should not under any means make use of these chemical weapons against their own population. That would produce serious consequences.' "